Mammoth Hot Springs and Vicinity. Topography Sheet XVIII. 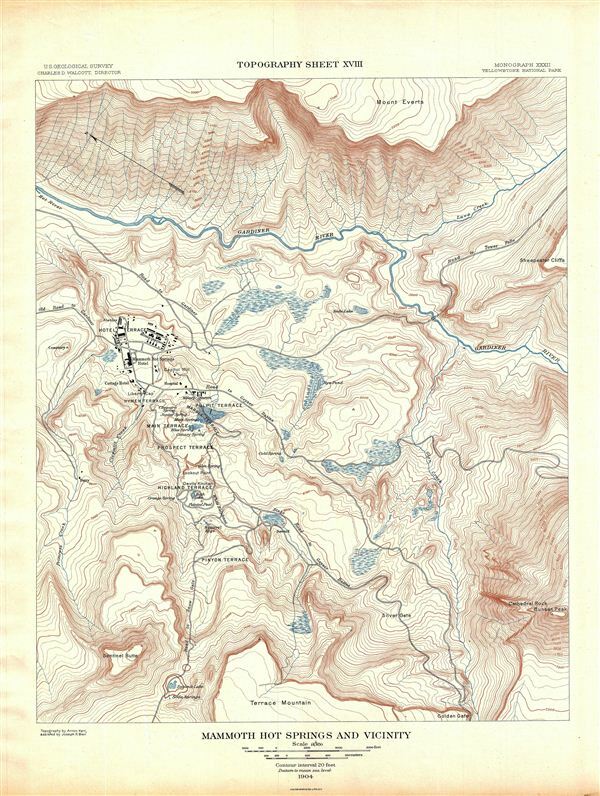 A fine example of Arnold Hague's 1904 topographical survey map of the spectacular Mammoth Springs in Yellowstone National Park, Wyoming. The map covers the Mammoth Hot Spring Terraces from Terrace Mountain to Mount everts. Building over thousands of years and still growing, the Mammoth Terraces constantly change shape and color. The map also features some buildings including the famous Mammoth Hotel build over the old terrace formation called Hotel Terrace. This particular map was part of Hague's study of the regions unique geology and the related geothermal activity. Throughout many other terrace formations are noted, including the Pinyon Terrace, Highland Terrace, Prospect Terrace, Main Terrace, Pulpit Terrace and Hymen Terrace. Published by the United States Geological Survey in 1904.